With our patented colorizer, a Rotochopper grinder can transform virtually any clean wood fiber to premium landscape mulch with the size, texture, and colors that consumers demand. From its launch in 1997, our patented colorizer set a new standard for efficiency and versatility. This game-changing approach to mulch allowed a broad range of companies to capitalize on the growth and sustainability of the premium mulch market. We have continued to raise the bar through ongoing improvement and innovation of the colorizer and by developing remote monitoring systems and other tools that help mulch producers maximize productivity and minimize costs. Following our commitment to continued innovation, the generation II colorizer, now standard on all Rotochopper grinders, utilizes an additional colorant spray bar to increase throughput capacity without compromising color integrity. The secondary spray manifold applies colorant to mulch particles while they are spaced apart and traveling at a high speed, ensuring even coverage. Enhancing this offering is Rotochopper’s ability to monitor and track key parameters, including, colorant usage, water, throughput, and engine data, with various RotoLink monitoring system options. Our exclusive grind & color system maximizes mulch quality while minimizing costs. 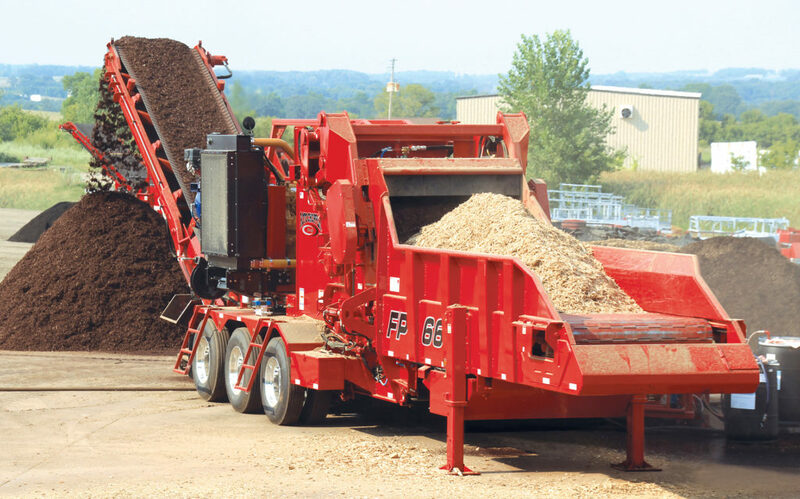 By reducing the number of machines and steps required to produce colored mulch, Rotochopper equipment dramatically lowers handling costs and spillage. Known for precision grinding capacity, Rotochopper grinders minimize the percentage of fines, increasing mulch volumes while decreasing colorant usage. Nothing creates more opportunities for wood waste than Rotochopper grinding equipment. A Rotochopper grinder can produce vibrant colored mulch from pallets, round wood, slabwood, and many other feedstocks. Designed for unmatched versatility and streamlined operation, Rotochopper electric and diesel horizontal grinders let operators switch feedstocks and end products quickly and easily. With Rotochopper, diversifying your business goes hand in hand with simplifying your grinding operation. As the only patented grind & color system, the Rotochopper colorizer continues to set the standard for high-efficiency mulch production. Available in a wide horsepower range to match your feedstock and product requirements, Rotochopper “Perfect In One Pass” technology will consistently produce vibrant mulch at the lowest cost per cubic yard / meter. This video showcases the exclusive advantages of the patented grind and color system available for Rotochopper wood grinders.